Drumragh Sarsfields Reserves kept the pressure on the league leaders by collecting another two points courtesy of a comfortable home win over Glenelly at Clanabogan Park on Sunday. Glenelly started brightly and led by three points to nil after 6 minutes. A point from Patrick Roche got the home side on the scoreboard before Ciaran Donaghey raced through to finish to the corner of the Glenelly net after 10 minutes to give the Sarsfields the lead. It was shortlived however as the visitors responded with a brace of points midway through the first half to go back in front. 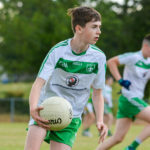 Drumragh responded with a Darragh O’Kane point before Patrick Roche goaled to give the Sarsfields a three point lead which they were not to surrender. Further unanswered points from Roche (3), Donaghey and Ronan Maguire before half time left the score at the interval, Drumragh 2-7 Glenelly 0-5. The second half was book-ended by goals for the away team, however they were interspersed by a further 1 goal and six points from the Sarsfields with Darragh O’Kane (0-4) Ciaran Donaghey (1-0) Patrick Roche and Eoin Rea (0-1 each) scoring for the home side to leave the final score Drumragh 3-13 Glenelly 2-5. This was another excellent performance by the young Sarsfields team in what has been another good season for this young team.